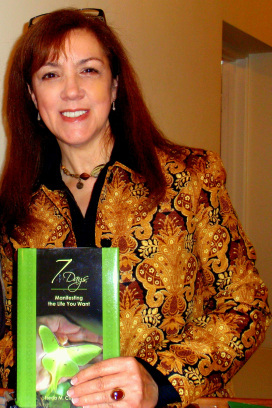 About the Author - 7 Days: Manifesting the Life You Want Freda M. Chaney, D.D. 7 DAYS: Manifesting the Life You Want by Freda M. Chaney, D.D. Freda wears many hats as an author, speaker, entrepreneur, wife, mother, and grandmother. Her writing career spans thrity years and includes: non‐fiction books, a young adult novel, children's books, several magazine articles and award‐winning poetry. In 2009, Freda had the honor of working with physicist and co‐author of The Orb Project (Beyond Words), Klaus Heinemann, Ph.D and his wife Gundi on their recent mind/body/spirit book Orbs: Their Mission and Messages of Hope (Hay House 2010). Freda's book KARMA ROAD is a full account of the story that appears in the Heinemann's book. Ms. Chaney holds a degree in Divinity, and has been a local keynote speaker. She is listed in Who's Who of American Women. Manifesting and recording the information for 7 DAYS took one full year. It is Freda's sincere desire to share this simplified method of manifestation with others through her book, videos and other support materials. All website content is copyrighted.